When you’re watching a series of movies, you’re bound to come across some that are really bad, but also some that are incredibly good, and I’ve certainly had my up’s and downs while reviewing all eight of the classic Universal monster movies this October. 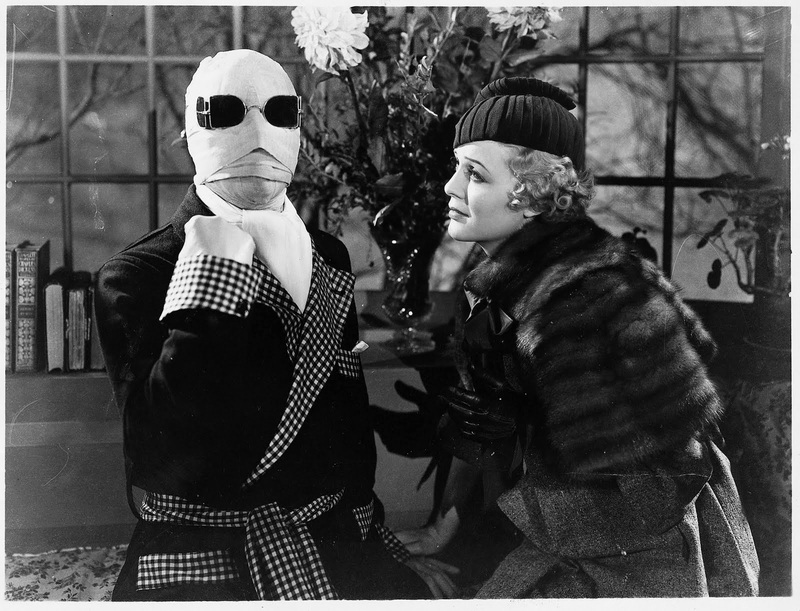 Now it’s time to talk about the 1933 motion picture “The Invisible Man”, and this is personally my favorite of the collection by far, actually it’s one of my all time favorite horror movies. I saw this film for the first time when I was just a kid, and it was one the very first black and white monster movies I’ve ever seen. This is the movie that got me watching all these old monster flicks, and it even got me watching black and white movies. The movie is based on a novel by H. G. Wells, the same author famous for writing “War of the Worlds”, and it’s directed by James Whale, the same talent that directed the 1931 “Frankenstein”. 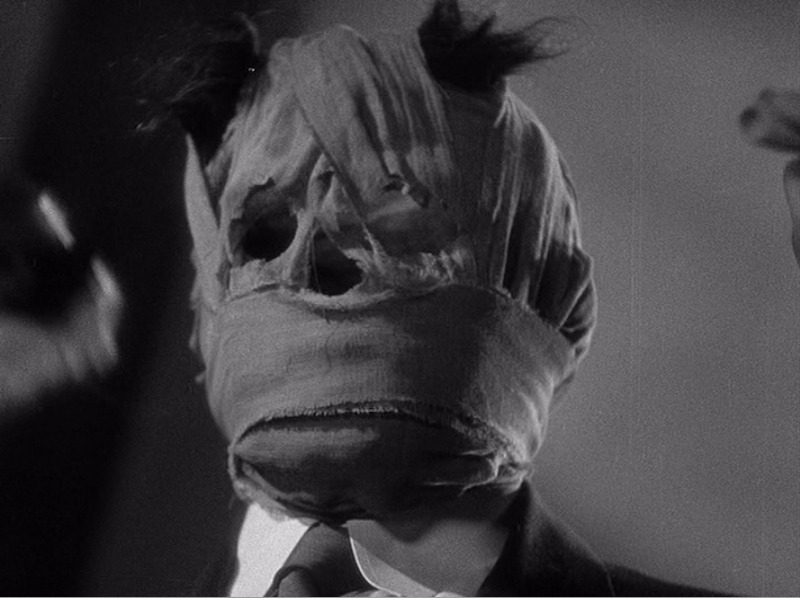 Even if you’re not a fan of these old monster movies, I can almost guaranty that you’ll have a fun time watching “The Invisible Man”. 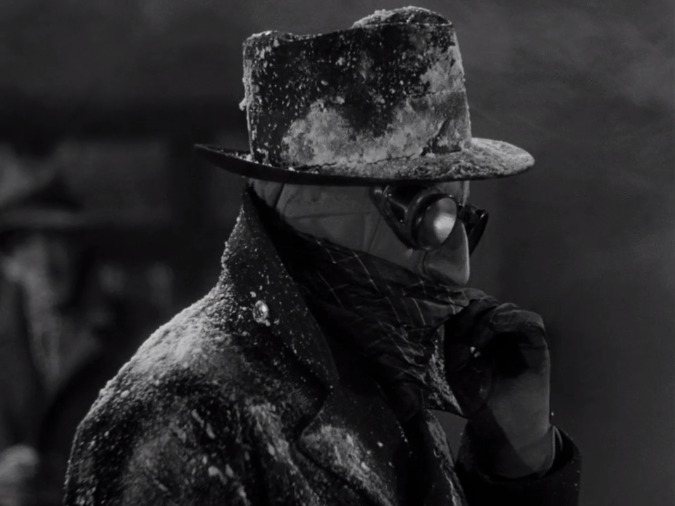 The story goes like this, a strange man wearing a heavy coat, black glasses, and completely bandaged face mysteriously arrives in a village, and quickly becomes the subject of gossip amongst the town’s people. Did this man get endured, is he hiding from the law, why’s he so secretive? Well, it doesn’t take long for the people to learn the truth, underneath those bandages and heavy coat is a scientist that accidently turned himself invisible. At first he just wants to create a cure, but a side effect in his serum is causing him to lose his mid. Once the town’s people cause him trouble, he gradually finds himself loving the novelty of being invisible, and begins to wreak havoc across the country side. Now the chase is on for the police to catch him, and for the invisible mans girl friend to help him in any way she can before he gets himself killed, or worse. 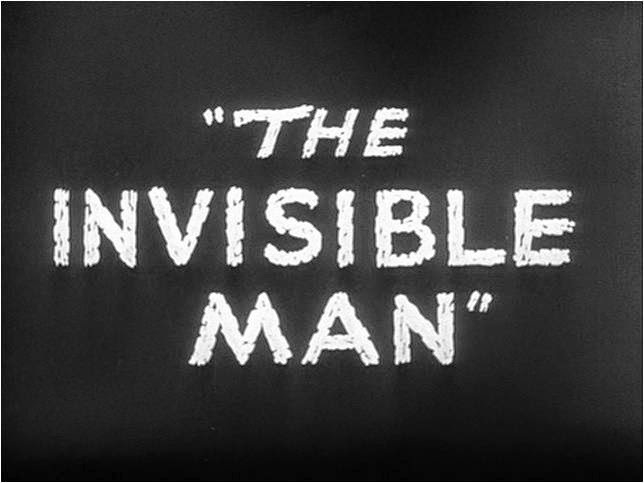 The Invisible man is played by Claude Rains, which was actually his debut performance, and what an awesome performance to kick off his carrier. Of all the talented actors who’ve brought these classic monsters to life, no one excites me as much as Claude Rains in this role. Not only is his voice chillingly sinister but his personality is outstanding, he perfectly balances the line between being intimidating, sympathetic, ruthless, heartless and hilarious. This is a villain that goes beyond your stereotypical horror movie bad guy, in fact he feels more like someone that belongs in a Shakespeare play, and the performance is just as operatic. He also has one of the most spectacular evil laughs I ever heard. You can never tell what this guys going to do next, sometimes he’ll flip out and let lose all his anger, then he’ll do something sadistically funny, or more often than not, he’ll be delivering an ominous monologue that’ll send chills down your spine. 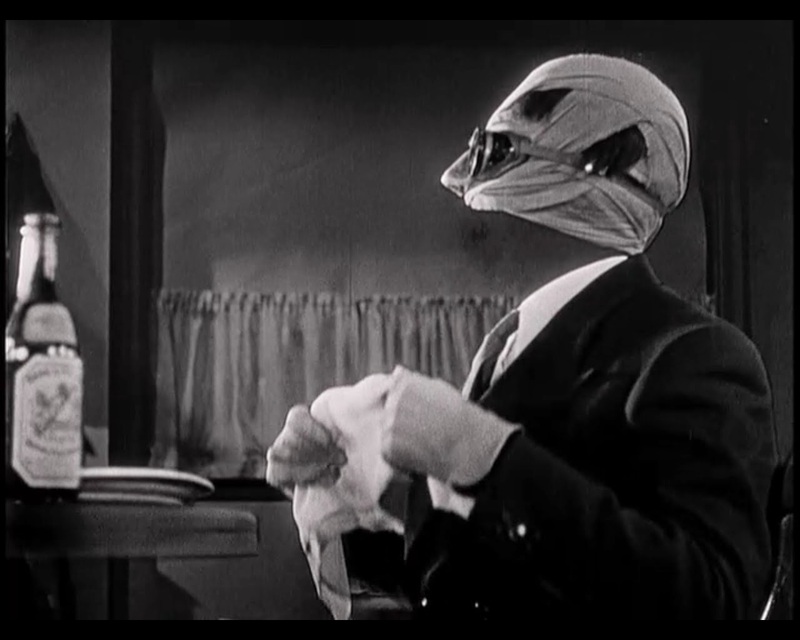 To call the invisible man my favorite of the eight Universal monsters is an understatement. 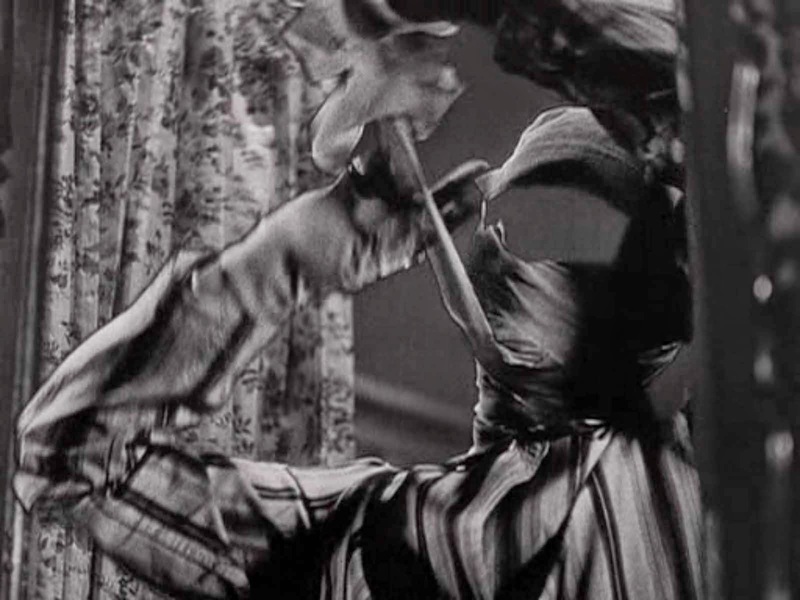 For his charismatic performance, chilling voice and dominating screen presence, the Invisible Man still stands as my favorite horror movie villain of all time. While most of these old horror movies from the 1930’s were good, they did admittedly have their boring moments, and a slow overtone. 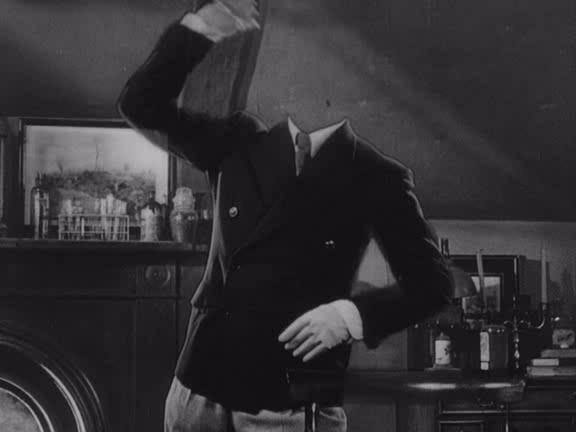 “The Invisible Man” on the other hand is anything but boring, from beginning to end it’s actually a really fun ride. 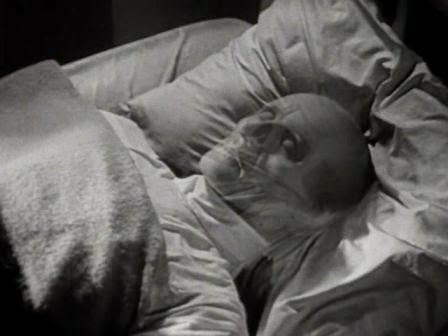 It’s without a doubt the funniest of the Universal monster movies, there’s some terrific slapstick, and the movie takes full advantage of how silly it is to have a naked man running around invisible, causing mischief everywhere. The effects are amazing, especially by early 1930’s standards. Every time he moves an object while invisible is very impressive, and leads to some really inventive moments. Then there’s scene’s in which he’s wearing clothes but he isn’t fully covered. For example, there’s an especially amusing moment when he’s wearing pajamas, but his head isn’t bandaged, this results in what looks like a functional man without a head. The girl friend in this movie is named Flora, and she had a lot of potential to be one of the strongest leading ladies, unfortunately, she just isn’t in the movie enough to leave a lasting impression. In the plus column, she surprisingly isn’t a damsel in distress stereotype. 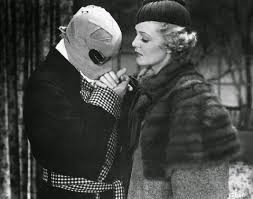 While the invisible man is madly in love with her, he never kidnaps her or threatens her in any way. She also doesn’t dress up in attractive clothes, or white gowns like all the others. I also like how she does everything she can to help, but like I said, the character just isn’t that active. 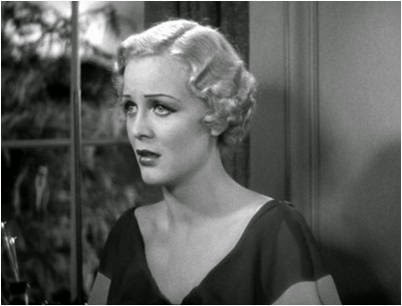 She’s played by Gloria Stuart, who would latter play the older version of Rose in James Cameron’s 1997 motion picture “Titanic”, now that’s what you call a long movie carrier. If I was to address one serious issue with this movie, it would be the supporting cast. I honestly think that Claude Rains was so good in the lead role that he sucked the talent out of everyone else. There’s a bunch of cops that deliver completely monotone performances, half of them look like they’re about to fall asleep, while the other half act like idiots. 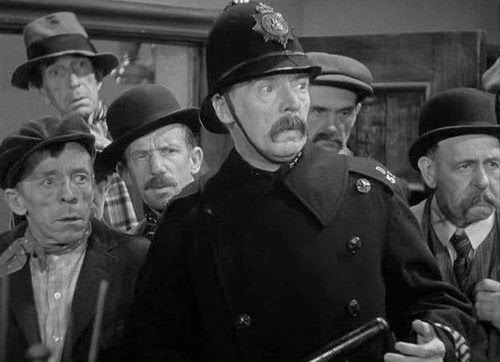 There’s a moment in which one of them gets startled by a cat, then starts shooting at the poor thing, and once the cat gets away, the cope starts complaining that he was attacked by the invisible man. 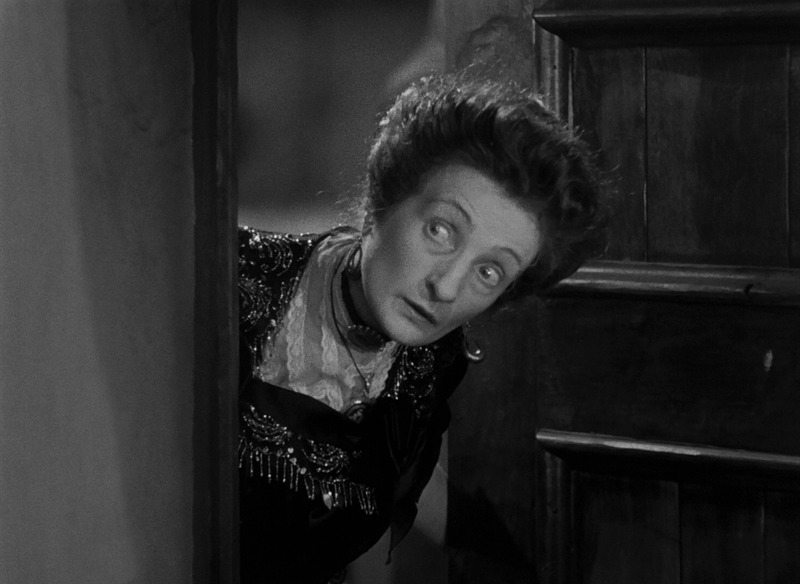 Worst of all is this woman played by Una O’Connor. She’s an inn keeper that discovers the invisible mans secret, and when she acts over the top, she really goes over the top. Every time she’s on screen, she yells and screams at the top of her lungs like a dying parrot, which is so annoying that I honestly feel like my ears bleeding. It’s interesting that most of these monsters only affect a small group of people, but the invisible man actually causes mass hysteria all across the country side, and dose a lot of damage. Dracula, the wolf man and all the others probably killed only a hand full of people, but this guys a real psychopath, killing anyone he wants, just because it’s fun. There’s actually a moment when he de-rails an entire train for no apparent reason. In the end, the cops pursue him to a farm house where he’s shot down. It may seem a little anti-climactic, but it’s actually a fitting finally, and the ending itself is great. As the invisible man dies, he slowly regains his visibility. It’s an awesome transformation scene, and the perfect high note to end the movie on. 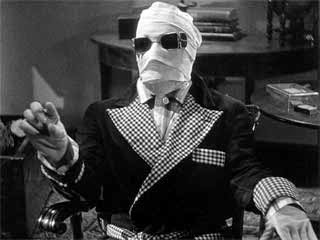 While Claude Rains never reprised his signature role as the Invisible Man, there were several sequels and spinoffs that followed. 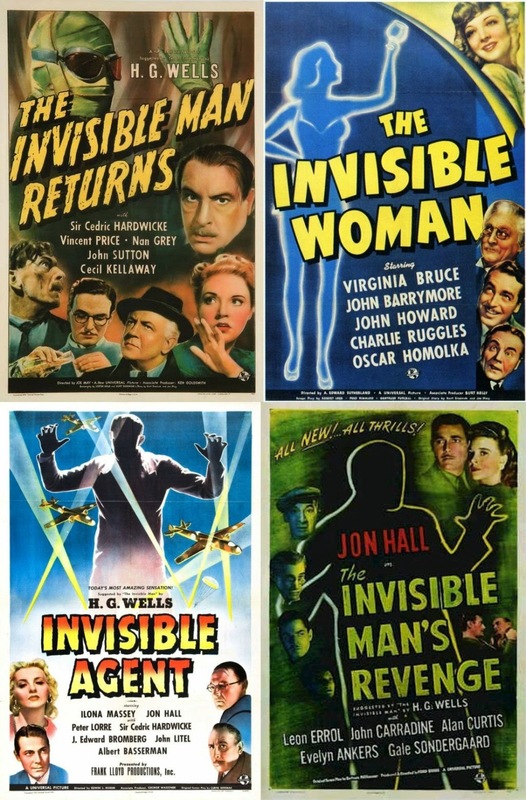 The first sequel is “The Invisible Man Returns” from 1940, followed by “The Invisible Woman” which came out that same year, then there was “Invisible Agent” in 1942, and finally there was “The Invisible Man's Revenge” in 1944. I actually haven’t seen any of these sequels yet, but I’m sure I will soon enough. 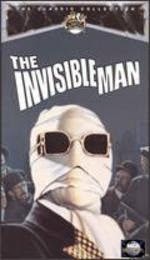 Over the years, the Invisible man has been featured in all kinds of media, in Halloween specials, comedy’s, and remakes. There was an especially funny crossover in 1951 titled “Abbott and Costello meet The Invisible Man”. I personally think this is one of Abbott and Costello’s funniest movies, and hands down their best monster crossover. 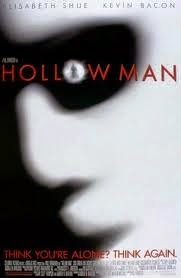 In 2000, there was a remake titled Hollow Man, which also had a string of squeals, but they were incredibly mediocre and forgettable. 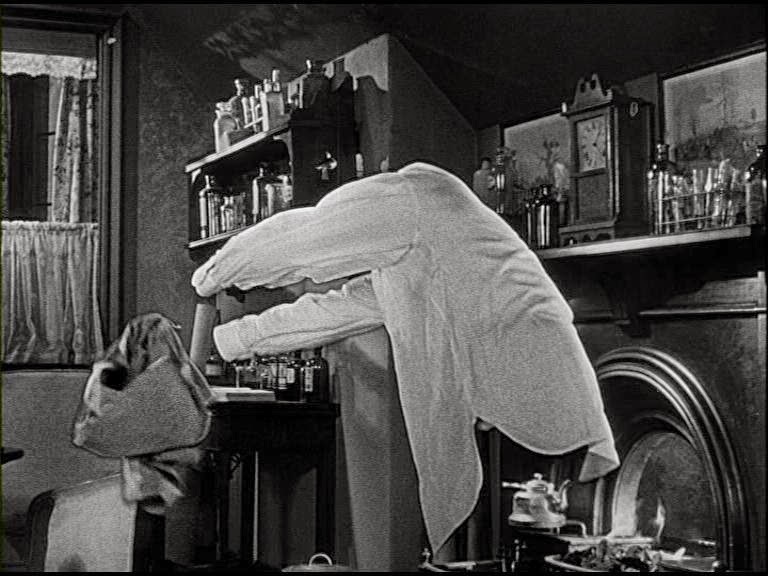 Overall, “The Invisible Man” holds up remarkably well, even to this day. Sure there are some annoying moments with the supporting cast, but the effects are still dazzling, and the film as a whole is still a lot of fun to watch. It’s funny, fast paced, and even suspenseful in its own simplistic way. More than anything, it features one of the greatest villain performances ever featured in a horror movie. 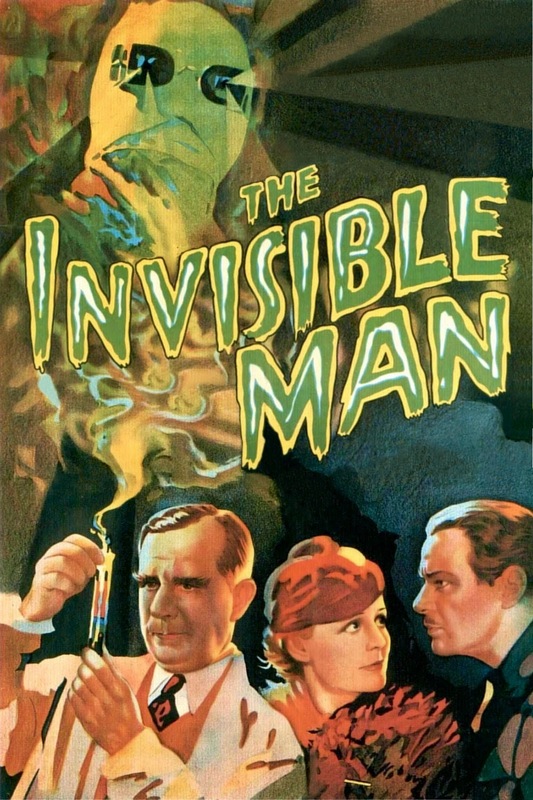 I still have four more classic Universal monster movies to review, and some of them are really good, but you can quote me on this, the 1933 motion picture “The Invisible Man” is without a doubt my absolute favorite of the eight, and personally, I think it’s one of the all time greatest black and White horror movies. NEXT TIME: One of the previous monsters will return . . . for a wedding! Did you know that you can create short links with AdFly and make dollars for every click on your shortened links. FreedomPop is the first FREE mobile phone provider. Voice, text & data plans costing you £0.00/month (100% FREE).